Not only are the technicians at RVFogDr experts at fixing your fogged windows- but they are equally skilled at a whole host of other RV related tasks as well. They can repair everything from a scratch on a single door- to creating a custom paint job on your entire rig. They are professionals in collision repair and major and minor damage repair, and use the most modern computerized equipment and high end paints to match your rigs original colors and finish. You can depend on their staff to make your rig look new when something goes “crunch in the night…..”. Although the RV FogDr staff is well known for their expertise in curing issues with fogged windows- you should know that they are equally skilled in repairing those things “that go bump in the night”- dents, scrapes, any kind of damage at all. They are experts in collision repairs- both major and minor- and have the finest computer color match equipment available- to ensure that once completed, your rig hits the road again looking just like new. From base coat to clear coat, their experts are truly professional in erasing the heartbreak of road rash and damage. They use the finest of paints- and can paint one door or the whole rig- and you won’t be able to tell that anything ever happened. They’re committed to making your job look perfect- and have the talent and years of training and experience to make it so. Take a look at caring and professionalism at work. 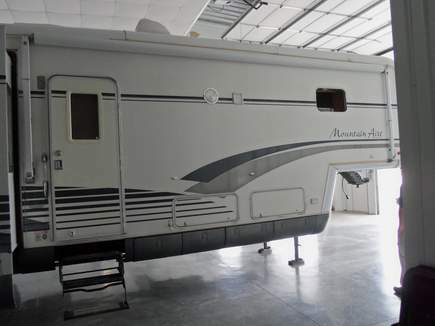 In this instance, a single door was damaged on this high line RV. The entire rig was placed in a protective plastic shield to prevent overspray or further damage as the repair progressed. Sanding and surface preparation completed, the staff used computer matching equipment to create an exact color match so that the balance of the motor home was not involved in the repair. Their equipment, expertise and DuPont professional paints save you money, and make both you and your insurance company happy by being able to complete a repair in the minimum of time, using only the necessary paint and materials to make it look like it never happened. You’ll be happy- and back on the road before you know it. Here’s another illustration of the creative skills you’ll find at RVFogDr. The owners of this 5th wheel loved the rig- hated the paint job. Didn’t want to sell or trade, so they had the paint pros at RVFogDr start from scratch- and create a custom paint job which made the rig look like new. All the old peeling decals were removed, the surfaces cleaned and prepared, then a new automotive style weather resistant finish was applied in multiple layers- to include all of the stripes and colors. The finished job in the next photo looks like it just rolled out of the factory. The owners are happy- and the cost of a new paint job was only a tiny fraction of the cost of trading. From “tired” to “totally awesome” – Just look at the reflection in the finished project. The entire body of the RV was painted with long lasting DuPont high line automotive finish and all of the decals are now painted graphics as well. With a little care, this renewal should last a decade or more, and give the owners a wonderful sense of pride. So, if you’ve got a scratch or scrape or two- or someone just crashed into your rig- think first of the folks at RVFogDr to get you back on the road again. They’ll go out of their way to ensure that you are comfortable while they are working on your rig- and that you’ll be proud of the completed job. Expert- professional- caring. Here are some other thoughts about the team at RVFogDr – If you’re having a refrigerator replaced or are upgrading to a residential one- who better to help you out than the folks at RVFogDr? – They have the expertise to remove any window to facilitate the replacement. They also can inspect and replace your roof seals- or repair that frustrating leak in a slide or on the roof. Make them your first call when you need these types of repairs done. You’ll be glad you did. RVFogDr owner Ed Covington will make you proud.